Assertive Outreach in Mental Healthcare: Current Perspectives explores experiences, successes, interventions, and service user stories as well as lessons learned from the implementation experience surrounding assertive intervention. It provides a synthesis of expert experience in the field as well as experiences of grass roots team practitioners. This book makes a valuable contribution to the field by addressing in depth a wide range of topics critical to the delivery of assertive outreach services and providing practitioners with a manual into which they can feed lessons learned from other teams for continuous service improvement. 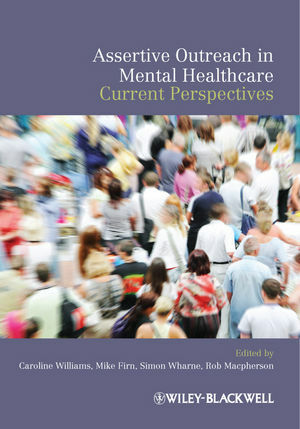 This book is an essential reference for anyone with an interest in assertive outreach and community treatment approaches in mental health. Caroline Williams is Company Director of User Friendly Psychiatry Ltd and a Programme Director and Clinical Tutor at Lancaster University. She was previously Assertive Outreach Manager at Five Borough Partnership NHS Trust, Warrington, Merseyside and has provided consultancy and training to Assertive Outreach teams in England and Wales. Caroline was also a National Steering Group Member of the National Forum for Assertive Outreach. Mike Firn is Clinical Service Development Lead at South West London & St. George’s Mental Health NHS Trust. He is also Chair of the National Forum for Assertive Outreach. Simon Wharne is the South East Regional Representative for the National Forum for Assertive Outreach and Team Leader for the Hastings and Rother Outreach Team. Dr Rob Macpherson is Consultant Psychiatrist in rehabilitation and assertive outreach, based at Wotton Lawn Hospital, Gloucester. He is also Training Programme Director for general adult psychiatry, Severn Deanery. Foreword (Kim T. Mueser, PhD). Editors' preface (Caroline Williams, Mike Firn, Simon Wharne and Rob Macpherson). 1 What does research tell us about assertive community treatment? (Andrew Molodynski and Tom Burns). 2 Multi-professional working in assertive outreach teams (Hannah Steer and Steve Onyett). 3 Fidelity and flexibility (Caroline Williams, Rob Macpherson and Mike Firn). 4 Cognitive behaviour therapy for assertive outreach service users (Robert Griffiths, Caroline Williams and Neil Harris). 5 Dual diagnosis: putting policy into practice (Rory Allott, Ian Wilson and Mike Firn). 6 Use of medication in assertive outreach (Rob Macpherson and Tom Edwards). 7 Relatives', friends’ and carers' experiences: involvement and support (Simon Wharne, Sara Meddings, Tizzie Coleman and Jo Coldwell). 8 Service user experience: engagement and recovery (Simon Wharne and Kamal Spilsted). 9 Assertive outreach: stigmatising treatment or social inclusion? (Simon Wharne). 10 Meeting the black and ethnic minority agenda (Simon Wharne and Neil Sanyal). 11 Diversity and assertive outreach (Simon Wharne and Caroline Williams). 12 Personal autonomy, leverage and coercion (Mike Firn and Andrew Molodynski). 13 Targets, outcomes and service evaluation (Mike Firn). 14 Funky mental health (Steve Morgan and Sue Jugon).